Vegetables: onion, carrot, red paprika, leek, green beans, salt, flavour, coriander, garlic, vegetable oil, vegetable fat, yeast extract, curry powder, cumin, sugar, potato startch, maltodextin, white pepper, potato starch, chili powder, ginger, soya sauce: soya bean, sate, wheat, sugar, shrimp powder, red beet extract, lemon juice powder. Prepare rice according to manufacturers instructions. While the rice is cooking, slice 500g pork or chicken meat into strips. 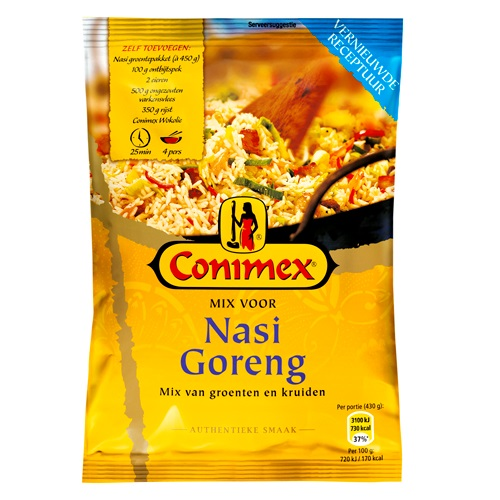 Bring 100ml water to a boil, add this pkg of nasi and soak for 10 min. Fry 100g bacon without oil, add 3 tbsp oil and slices of meat, cook til browned. 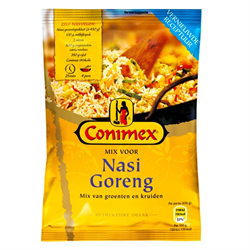 Add swollen nasi mix & 2 fried eggs, fry for 2 min. Add rice, stir well. Serve hot. Contains wheat, gluten, soy, sesame and shrimp.